What Is Your Favorite Phase of the Rut? The November rut is here! You’re ready to charge forth into the woods with bow or gun, pumped to put the smackdown on a 10-pointer. Whoa, slow down man. 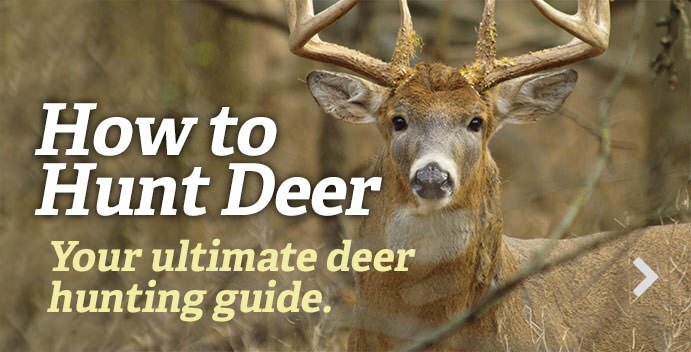 Take a deep breath and a few minutes to consider the deer behavior, food sources, weather and moon during the week you’ll take off work or school. The stages of the rut vary a bit throughout the month. But whichever week you choose, we’ve got you covered with this week-by-week plan on how to hunt the rut. Deer Behavior: While some mature bucks will stay on your property late in this pre-breeding period, others will start to expand their range. Be on the lookout for “new” bucks you’ve never seen before moving onto your spot, searching for the first hot does. All bucks rub and scrape heavily to vent sexual frustration and to leave their calling card, but they do it mostly at night. Most does are days or a week from estrus; they continue on a bed-to-feed pattern. Key Signs: Big rubs; large, fresh scrapes. Moon: The first-quarter phase starting Nov. 2 should enhance the seeking phase of the pre-rut leading into the full moon -- fueling hot afternoon hunting. Science Fact: Dr. Karl Miller and cohorts conducted a trail-camera study in Georgia and found that bucks build scrapes in high-traffic spots where other does and bucks will see and smell them. One of the most common places was at the junction of two deer trails. Top Stands: With the way the moon is lining up, I think this could be the best week of rut hunting we’ve seen in years, especially if we have cool weather. Afternoon hunting near a food source will be killer. Get in your best stand near the best feed on your place and go for it. My gut is that some giants will be killed an hour before last light. A killer morning stand is on the edge of a CRP field, an overgrown pasture, an old clear-cut -- you get the picture -- 200 to 400 yards off the feed field or mast you hunted last evening. Many does will gravitate there to bed. Big bucks will cruise in the chest-high cover after them. It is a perfect spot to rattle; hunt until 11:00 a.m. or so. Look for scrapes dug 100 yards or so below a brushy ridge top and hunt nearby; bucks like to bed on a ridge or bench and scent-check the scrapes below. If you use trail cameras, keep them rolling; this week at scrapes you’ll get images of most of the bucks on your land, both the locals and the passersby. This is the best week for rattling, which works best on a cool, still morning. Try setting a tarsal scent bomb near your stand; a brawler buck might come to your stinky challenge. If you’re bowhunting, try a buck decoy on the edge of a field near your stand. Grunt at every buck you see wandering through the woods or dogging a doe, and do some blind calling every 30 minutes or so on stand; you can’t grunt too much this week. Deer Behavior: Last days of pre-breeding and into the breeding stage. You’re apt to see a buck prowling with his nose to the ground (with or without a doe in sight), chasing a gal flat out, standing over a doe and guarding her or even mounting one. Studies show that most mature does come into heat around Nov. 7 or 8, and 80 percent of them will be bred over the next two weeks. If you suddenly stop seeing bucks on the move, the “lockdown” has begun; mature bucks have moved receptive does away from competing lesser bucks and carted them off to thickets where they’ll shack up for a couple of days. This might occur later in this week. Key Signs: Well-trampled doe trails; buck tracks (3 to 4 inches long and 2 inches wide). Moon: The best deer movement (and the best hunting) will shift to mornings and middays as bucks chase and breed during the full moon on Nov. 10. Science Fact: A Texas study of radio-collared bucks found that all of them (100 percent) left their home ranges during the peak rut and went on doe excursions; some of those trips lasted one to three days and covered one to five miles. So the big buck you’re hunting might leave for a bit -- but a bigger one you’ve never seen might show up! Top Stands: Try a timbered ridge flanked by row crops on two sides, or, better, grain on one side and CRP, a swamp or other heavy cover on the opposite border. One November in Illinois, my buddy Dan bowhunted a favorite ridge like that and had 18 bucks run past his stand with one hot doe -- they were moving so fast, he couldn’t get a shot at the 190-incher in the rear! You can have amazing action on the right ridge this week. The more signs there, the better. It ought to smell like a barnyard of deer. A great all-day stand for gun hunting is a point-to-point crossing. Hang a lock-on or ladder just inside a strip of trees that juts out into a weed field and creates a pinch with the timber on the far side of the field. Bucks trolling for or chasing does will move all day in this type of cover. Lay a hot-doe trail right to your stand, remove boot pads or drag line, hang it 4 feet off the ground, and juice it some more; you can’t put too much “eau de doe” in the air now. Keep rattling; you might call in nearly as many bucks this week as last. Blow long, aggressive grunts for 10 to 20 seconds on your grunt call; sound throaty and gurgling, like a horny buck tending a doe. Mix in sassy doe bleats on a can-type call; a rut-crazed buck might hear it and come in. Sit in a good stand all day; you might shoot your buck anytime. Even if you don’t see a shooter from your best stand one day, come back tomorrow and the next day; a big buck on a doe excursion might not be on your land every day, but he’ll swing through eventually -- be there when he shows. Deer Behavior: Breeding is still going strong in most areas, but beginning to fade in other places. Depending on whether your rut is a few days early or late, you might see bucks wandering alone or chasing does; some will be locked down with gals. This is the week when every gun hunter and his brother hits the woods; the pressure moves rutting deer deeper into cover, and they move a lot at night. Key Signs: Primary doe trails; buck tracks; scrapes with fresh pawing. Moon: Good midday deer movement continues during the full moon; as it moves to last-quarter Nov. 18 when early mornings will be better. Science Fact: A University of Georgia study found that toward the end of this week bucks go back to checking old scrapes and even re-working some of them as they hunt for fewer and fewer receptive does. Top Stands: Set up where two or three ridges and adjacent thick-cover draws converge and peter out in a creek or river bottom. All the terrains create a dumping ground for does and the bucks after them. You also need at least one post to play off the pressure. A few years ago in Kentucky, my friend David leased 200 acres that bordered a public area. He didn’t hunt it in October, but went there on opening morning of rifle season in mid-November. Dave sat at the top of a hollow where he could watch brushy draws and finger ridges below. The sun rose and rifles cracked on the public ground. Dave spotted five bucks escaping in the cover, and he shot the biggest, a 150-incher. If the deer activity is still good, sit in a stand all day because some breeding is still going on; you probably won’t see as many bucks at midday as last week, but it only takes one with a big rack to come by and make your season. This week I generally back off “blind rattling” because skittish deer have heard clashing antlers (both real and fake) for weeks. But keep grunting. Go back and scout the biggest, best scrapes you found around Halloween; if they’ve been hit again, hunt them. Deer Behavior: Post-rut begins, but there is still more breeding going on than you think. If you get lucky and see one of the last receptive gals, you’re apt to see three to five bucks hassling her. The does that have been bred move back to food plots, fields, browse and other food sources. Big bucks are tired, spooky and largely nocturnal; the colder it is this week, the more likely you’ll catch one in daylight hours. Moon: A dark-night week, with the new moon on Nov. 25. Expect deer to move best the first and last hours. But since bucks are rut-tired and skittish, sightings and movement will be erratic. Science Fact: Research of collared bucks from Maryland to Texas shows that 20 to 40 percent of mature bucks continue to make long trips out of their core areas in the post-rut in search of the last hot does. Top Stands: Most crop fields have been picked clean and some are frozen, but it doesn’t take a lot of feed to attract rut-weary deer. A few years ago in Iowa, I scouted a 500-acre soybean field that looked like a concrete parking lot. In one corner, I found a quarter-acre strip of beans the machines had missed. I slipped in that afternoon, saw 13 deer and shot a 160-inch, 10-pointer that came to the beans just before dark. I was mobile, slipped in and surprised those deer near the last good feed for miles. For a late-rut morning hunt, try an overgrown cedar field, tamarack flat, etc., with good, broken cover that sits a half-mile or so off a grain field. A creek or river bottom makes it better. Hunt high from a lock-on or tower stand so you can watch down into the cover. Keep rechecking scrapes and hunt in the vicinity of any with new activity. Lay an estrus-doe trail into your stand; a buck on a last hookup mission might cut it and come in. If you hunt private ground where the pressure has been relatively light all month, try rattling in the mornings. Studies show the post-rut is one of the best times to lure a 4 1/2-year-old buck. Don’t miss a day if the temperature dips into the 20s or teens because some bucks will hit the feed in daylight; when the temperature rises, they’ll go nocturnal again. Editor's Note: This was originally published November 2, 2011.